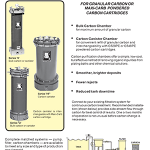 For continuous carbon treatment. Simply open the bypass valve between chambers a small amount and allow a percentage of the pump flow to continuously pass through the carbon chamber and back to process tank (the remainder of the flow will continue to pass through the filter chamber and back to process tank). This innovative SERFILCO design eliminates down-time, labour intensive powdered carbon treatments, inefficient carbon discs and cartridges and lost chemistry due to constant manual change outs and carbon treatment. 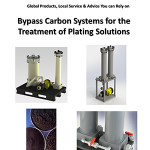 No downtime – no need to stop production when the carbon needs changing, just turn a valve. 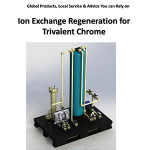 No more labour-intensive carbon treatment! The treatment units are small and usually can be located right at the plating tank. 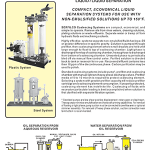 Treatment is simple, consisting of pumping solution from the tank, through the treatment unit and back to the tank. Copper, zinc and nickel ions are all removed from the bath simultaneously. Treatment can be done during bath operation (no shutdown time required). Treatment can be done continuously or intermittently depending on need. Regeneration of the ion exchange resin takes about two hours and occurs about every week to two weeks for a properly sized treatment unit.